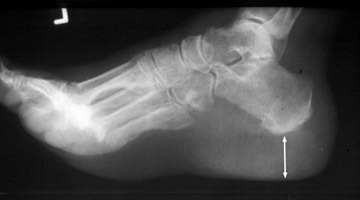 Single lateral radiograph of the foot with a grossly enlarged and thickened calcaneal heel pad. Although not pathognomonic, a heel pad thickness greater than 23 mm may indicate acromegaly. The overabundance of growth hormone in acromegaly causes, among other things, gradual enlargement of hands, feet, and exaggeration of facial features. Not limited to the bones, however, enlargement of other parts of the body, such as the soft tissues of the heel may help to diagnose acromegaly.